The new format of Paris–Tours, which underwent a radical change with the introduction of unpaved vineyard tracks, set the stage for a thrilling showdown in the final 60 kilometres as the new difficulties blew the peloton apart. AG2R La Mondiale and Quick-Step, particularly Niki Terpstra, lit the fireworks, but Søren Kragh Andersen was the smartest rider in a three-man group that went clear on Côte de la Rochère, giving his companions the slip 11 km before the line. After losing out to Matteo Trentin on Avenue de Grammont last year, the 24-year-old Dane made amends with a solo ride that earned him the greatest win of his career. 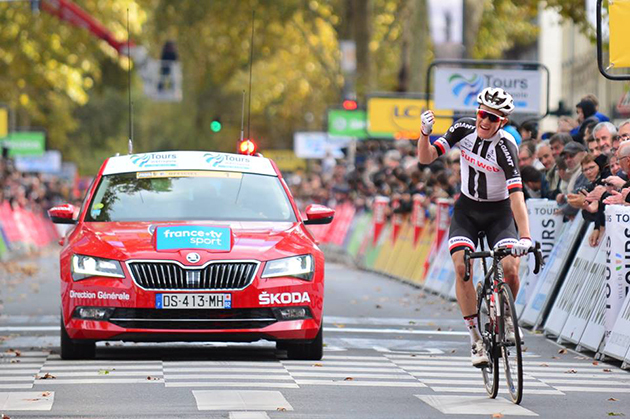 Niki Terpstra and Benoit Cosnefroy escorted him on the podium of the 2019 edition. 153 riders started the race after WB Aqua Protect Veranclassic withdrew to mourn the death of Jimmy Duquennoy. It was Bernhard Eisel (Dimension Data), Sylvain Chavanel (Direct Énergie) and Brian Van Goethem (Roompot–Nederlandse Loterij) who fired the opening shots after 4 km, soon to be joined by Thibault Guernalec (Fortuneo–Samsic), Dries De Bondt (Veranda's Willems–Crelan) and Emiel Vermeulen (Roubaix–Lille Métropole), who caught the lead group at km 18 after a short chase. The gap to the peloton, which had been 2' at the time of the merger, had risen to 3' 15" by km 50 as a tailwind helped the escapees to cover 51.2 km/h in the first hour of racing. Despite several attempts to shake the tree, especially by Quick-Step, the peloton continued to lose ground, with the gap peaking at 5' 40" at km 58. FDJ then moved to the front of the main group and, finally, 110 kilometres into the race, AG2R brought the hammer down and caused a temporary split. The difference to the breakaway dwindled to 40″ and Tom Devriendt (Wanty-Gobert), Alex Dowsett (Katusha-Alpecin) and Johan Le Bon (Vital Concept) seized the opportunity to stage a counter-attack, eventually making it across at km 127. The breakaway, now nine men strong, went through km 150 with 1' 40" to spare. AG2R and Lotto–Soudal raised the pace again as the peloton neared the first vineyard track (km 165), leading the main group into the sector a mere 20 seconds behind the two remaining escapees, Devriendt and De Bondt. The infernal pace took its toll on the peloton, with riders being dropped left, right and centre on the second vineyard track. By the time the leading duo was caught with 45 km to go, the main group had been reduced to just 34 men. Niki Terpstra attacked on La Grosse Pierre track (km 175), taking Philippe Gilbert, Søren Kragh Andersen, Jelle Wallays, Valentin Madouas, Pascal Eenkhoorn and Sep Vanmarcke with him. Their difference peaked at 15" before AG2R closed the gap. Terpstra doggedly tried again, latching onto the wheel of Andersen when the Dane sparked another move. Benoit Cosnefroy joined the duo 25 km before the line. The leading trio hit the Peu Morier climb (km 192) with 40" over Valentin Madouas, Oliver Naesen and Sep Vanmarcke, with the peloton, now reduced to just 10-odd men including Démare, Wallays, Gilbert and Benoot, trailing a further 20 seconds behind. It became clear with 12 kilometres to go that the race was going to be decided between the two groups of three men, separated by 45", with the Gilbert-Démare group 1' 15" back and out of contention. Barely a kilometre later, Andersen jumped away from his breakaway companions. The Dane capitalised on the lack of reaction from Terpstra and Cosnefroy, who came in 25" behind, with the Dutchman taking second place. 3 BENOIT COSNEFROY Ag2r La Mondiale s.t. 5 VALENTIN MADOUAS Groupama-FDJ s.t. 6 TIESJ BENOOT Lotto-Soudal s.t. 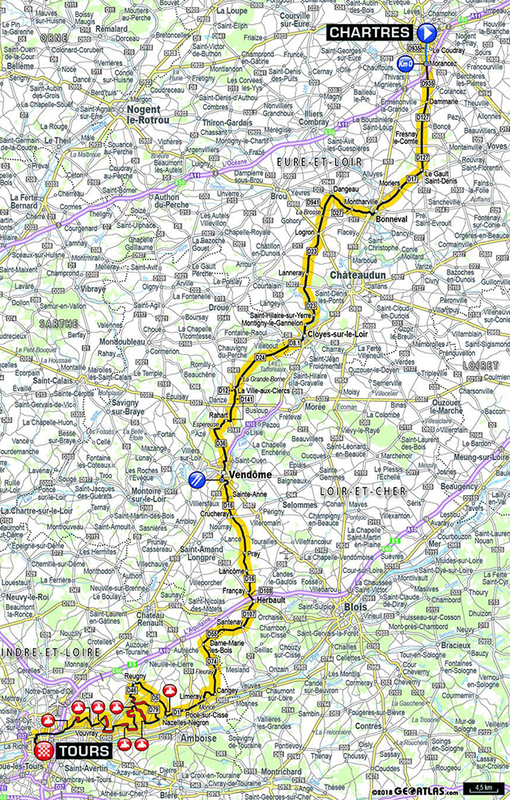 7 SEP VANMARCKE EF Education First-Drapac s.t. 8 PHILIPPE GILBERT Quick-Step Floors s.t. 10 JOS VAN EMDEN LottoNL-Jumbo s.t. 13 JOSÉ GONÇALVES Katusha-Alpecin s.t. 15 DAMIEN TOUZE St Michel-Auber 93 s.t. 20 JONAS VAN GENECHTEN Vital Concept s.t. 21 TOM DEVRIENDT Wanty-Groupe Gobert s.t. 22 TOM VAN ASBROECK EF Education First-Drapac s.t. 23 MAARTEN WYNANTS LottoNL-Jumbo s.t. 25 YOANN OFFREDO Wanty-Groupe Gobert s.t. 26 JESPER ASSELMAN Roompot-Nederlandse Loterij s.t. 28 FABIO JAKOBSEN Quick-Step Floors s.t. 29 GIJS VAN HOECKE LottoNL-Jumbo s.t. 30 ANDREA PASQUALON Wanty-Groupe Gobert s.t. 31 RAMON SINKELDAM Groupama-FDJ s.t. 32 GUILLAUME BOIVIN Israel Cycling Academy s.t. 33 TIMO ROOSEN LottoNL-Jumbo s.t. 34 REINARDT VAN RENSBURG Dimension Data s.t. 35 ADRIEN PETIT Direct Energie s.t. 36 JONAS RICKAERT Sport Vlaanderen-Baloise s.t. 37 PATRICK MÜLLER Vital Concept s.t. 38 PAUL OURSELIN Direct Energie s.t. 39 DIMITRI CLAEYS Cofidis s.t. 40 MAURO FINETTO Delko-Marseille Provence s.t. 41 KEVIN LE CUNFF St Michel-Auber 93 s.t. 42 DRIES VAN GESTEL Sport Vlaanderen-Baloise s.t. 43 BRIAN VAN GOETHEM Roompot-Nederlandse Loterij s.t. 44 BRICE FEILLU Fortuneo-Samsic s.t. 45 SYLVAIN CHAVANEL Direct Energie s.t. 46 ALO JAKIN St Michel-Auber 93 s.t. 47 EDVALD BOASSON HAGEN Dimension Data s.t. 49 ODD CHRISTIAN EIKING Wanty-Groupe Gobert s.t. 50 ALEXANDRE PICHOT Direct Energie s.t. 51 BERT DE BACKER Vital Concept s.t. 54 YOANN PAILLOT St Michel-Auber 93 s.t. 59 MAXIME FARAZIJN Sport Vlaanderen-Baloise s.t. 60 MICKAEL DELAGE Groupama-FDJ s.t. 61 MILAN MENTEN Sport Vlaanderen-Baloise s.t. 62 QUENTIN PACHER Vital Concept s.t. 63 NICOLAS EDET Cofidis s.t. 64 JON ABERASTURI Euskadi-Murias s.t. 65 LUUC BUGTER Veranda's Willems-Crelan s.t. 66 MORGAN KNEISKY Roubaix-Lille Metropole s.t. 67 CONNOR SWIFT Dimension Data s.t. 68 AUGUST JENSEN Israel Cycling Academy s.t. 69 BERT VAN LERBERGHE Cofidis s.t. 70 DRIES DE BONDT Veranda's Willems-Crelan s.t. 71 JENS DEBUSSCHERE Lotto-Soudal s.t. 72 CHRISTOPHE LAPORTE Cofidis s.t. 73 YVES LAMPAERT Quick-Step Floors s.t. 74 ANTHONY TURGIS Cofidis s.t. 75 SENNE LEYSEN Veranda's Willems-Crelan s.t. 76 CEES BOL Team Sunweb s.t. 77 ROMAIN CARDIS Direct Energie s.t. 78 JULIUS VAN DEN BERG EF Education First-Drapac s.t. 79 DANIEL MCLAY EF Education First-Drapac s.t. 80 DYLAN GROENEWEGEN LottoNL-Jumbo s.t. 81 OLIVIER LE GAC Groupama-FDJ s.t. 82 FLORIAN SENECHAL Quick-Step Floors s.t. 83 JOHAN LE BON Vital Concept s.t. 84 BRAM WELTEN Fortuneo-Samsic s.t. 85 JULIEN DUVAL Ag2r La Mondiale s.t. 86 NIKOLAS MAES Lotto-Soudal s.t. 87 MAXIMILIAN WALSCHEID Team Sunweb s.t. 88 MATTI BRESCHEL EF Education First-Drapac s.t. 90 TONY MARTIN Katusha-Alpecin s.t. 91 PIERRE IDJOUADIENE Roubaix-Lille Metropole s.t. 92 JHONATAN RESTREPO Katusha-Alpecin s.t. 93 OMER GOLDSTEIIN Israel Cycling Academy s.t. 94 DMITRII STRAKHOV Katusha-Alpecin s.t. 95 JAY ROBERT THOMSON Dimension Data s.t. 96 NICOLAS DOUGALL Dimension Data s.t. 97 JULIEN ANTOMARCHI Roubaix-Lille Metropole s.t. 98 JÉRÉMY LEVEAU Delko-Marseille Provence s.t. 99 THIBAULT GUERNALEC Fortuneo-Samsic s.t. 100 ARNAUD GERARD Fortuneo-Samsic s.t. 101 FLORIAN VACHON Fortuneo-Samsic s.t. 102 FREDERIK FRISON Lotto-Soudal s.t. 103 XANDRO MEURISSE Wanty-Groupe Gobert s.t.